Architects have thousands of choices to make when designing a building. On the other hand, they also make thousands of trade offs. However, there are always a few elements critical to them. Maybe it is something that is performance-based, such as HVAC or a roofing system; or maybe aesthetics are prominent, such as the flooring in the entryway. The owner may also have specific design specifications. Then there are products mandated by building codes. Knowing where your product falls in these categories is essential when showing the architect how your product or brand can help them achieve the ultimate vision for their buildings. The comprehensive Accountability Architects’ Brand Preference Study in 2008 reveals the competitive nature of flooring materials in terms of competition from the architect’s perspective. Although the specific brands may have changed since 2008, the mindset holds true. 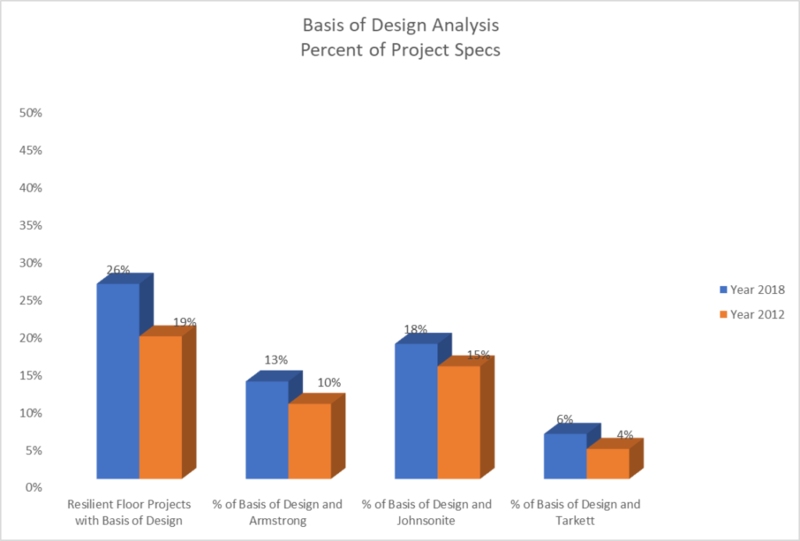 Per the study, there seem to be many factors that manufacturers need to consider when analyzing where they stand in the market, especially in relation to architects’ perception of their brands.Foremost is to discover an architect’s level of involvement when specifying particular products. Taking flooring as an example. The degree to which architects are involved in specifying flooring and prefer a specific manufacturer or brand varies by the type of flooring and the space it will occupy. Specifically, the study showed that although more than half of the respondents in the Laminates sub-category noted they specify these products and have manufacturer/brand preferences (53%), another 25% said they are involved, but have no preference. In Rubber/Resilient Flooring, 51% of respondents said they actively make decisions and have manufacturer/brand preferences; an additional 30%, however, make the decision, but have no preference. It is important to note that architects who stated no preference are, in fact, involved in specifying and recommending flooring products; they simply do not favor any particular brand. That’s 81% that are involved in specifying resilient flooring. That is significant enough to take notice. What should floor manufacturers do to enhance brand preference? How can manufacturers convert “no preference” answers into specifications and recommendations for their brands? These are important considerations. So what’s next? Let’s consider what we know about specifications. They key to gaining ground in specifications is to become part of the “basis of design.” We used ConstructConnectInsight, an online construction data database, to get a better sense of how resilient floors are specified by searching the specifications for “Resilient Floor Projects with Basis of Design.” Interestingly, only 26% of projects in 2018 had resilient flooring specified as the basis of design. However it has gained space since 2012 where it was specified in 19% of the specifications. What that means for you as a resilient flooring manufacturer is there is room for growth. The opportunity to reach architects is an open market…you can affect the basis of design …and you can change the vision in the crystal ball. Although many manufacturers are fighting to be the basis of design, a well planned contact, education and market strategy can help provide clarify the path to specification. The same research can be done on the other product categories conducted in the Accountability Architects’ Brand Preference Study. Let us know where your interests are.